Product quality and detail ..it shows! M&R informs you of the assembly rating of each unit. Easy to understand operating instructions and installation recommendations are provided to maximize unit life. "CLASSIC"...Cam Buckle Motorcycle Tie-Down... with the 1" Quick Pull-Tight and Press-Release Cam. 1" Nylon Webbing (4,500 Lb. Test) with sewn hand loops ends. Vinyl Coated "S" Hooks on both ends. Each strap is a 1200 Lb. MBR. assembly. "POWER CLASSIC"...Ratchet Cycle Tie-Down... utilizes the mechanical power of a 1" Ratchet to achieve maximum-constant tension during highway trailering of your cycle. 1" Nylon Webbing (4,500 Lb. Test) with Vinyl Coated "S" Hooks on both ends. Each strap is a 1,200 Lb. MBR. assembly. "RATCHET SNAPPER"...1" Ratchet Snapper Motorcycle Tie-Down...similar to Power Classic with security feature of a heavy duty snap hook with keeper on adjustable long end providing positive lock to attachment hardware. "CAM SNAPPER"... is similar to the 1 inch "Classic Cycle Tie-Down", but with an added security feature. A heavy duty Snap Hook with Spring Loaded Keeper is on one end which securely locks to your trailer "D" Ring or eyebolt. Vinyl Coated "S" Hook is on the other end for attachment to your cycle. Each strap is a 1,200 Lb. MBR. assembly. "CAM SOFT TOUCH"... long end ... 1" cam motorcycle Tie-Down with "Soft Touch" feature on long end. Similar to "Original Cam Tie-Down". Protects chrome & paint finishes. "RATCHET SOFT TOUCH"... long end ... 1" ratchet motorcycle Tie-Down with "Soft Touch" feature on adjustable long end. Similar to "Power Classic". Protects chrome & paint finishes. "FOUR PACK"... Ideal Foursome ... featuring four (4) 1" Tie-Downs Straps, a pair of "Classic and a pair of "Power Classic" Cycle Tie-Downs, designed for four (4) point-tie-down of your larger motorcycle or ATV. Each strap is a 1,200 Lb. MBR. assembly. "WORKHORSE"... Big Classic Cycle Tie-Down... a 2" Cam Buckle Unit, with all the tried-proven features of the "Original Cam Buckle Unit", plus the added features of 2" 6,500 Lb. Test Cordura Webbing and 2,500 Lb. Heat Treated Vinyl Coated "S" Hooks on both ends. Designed for cycles weighing 750 Lbs. or more. 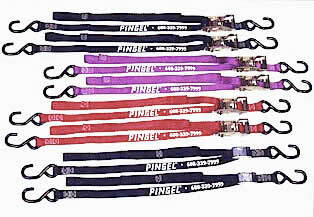 The strongest Cam Buckle Cycle Tie-Down on the market! Each strap is a 2,500 Lb. MBR. assembly. "POWER FOUR PACK"... 2" Motorcycle 4 pack kit ... 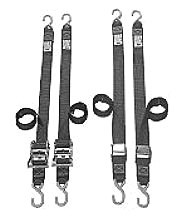 Consisting of a pair of P/N 64801-10 "Work Horse" and a pair of P/N 64811-10 "Power Pack" Cycle Tie-Downs, each designed for safe trailering of heavy-large motorcycles or ATV's. "POWER PACK"... Heavy Duty Ratchet Cycle Tie-Down ... utilizes the mechanical power of a Trim-Durable 2" Ratchet to achieve maximum-constant tension and the ultimate security during highway trailering. 2" Cordura Webbing with Heat Treated Vinyl "S" Hooks on both ends. Designed for your larger/heavier Motorcycle/ATV. Each strap is a 2,500 Lb. MBR. assembly. "WHEEL TIES"... Bounce Eliminator... designed to secure your motorcycle wheels to Channel or Rail Section Cycle Trailers. Eliminates "Road Bounce" during cycle trailering. 1" Poly Pro Webbing looping back into a Spring Load Buckle. Each strap is a 600 Lb. MBR. assembly. "SOFT TOUCH"... Protector ... designed with 6" Loops Both Ends to eliminate all metal-to-metal contact ... the best protection for your paint or chrome. 1" 4,500 Lb. Nylon. 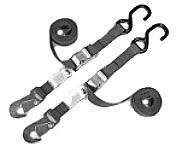 Use in conjunction with 1" or 2" Cycle Tie-Down straps. Also can be used as a "Tie-Down Extension". Each strap is a 2,500 Lb. MBR. assembly. Made to use with tie-downs, these 1" wide, 16" long straps have loops at each end. When used properly, they prevent scratches to fairings and chrome, and increase the length of tie-downs from 8”-14". Sold in pairs. "SUSPENSION LIMIT STRAP"...Press release cam ...1" cam buckle motorcycle "Suspension Limit Strap", 4,000 lb. test nylon, 1,500 lb. rated. "Pull-tight" - "Press Release Cam". Hand loop ends. Pre-drilled bolt plate ends. 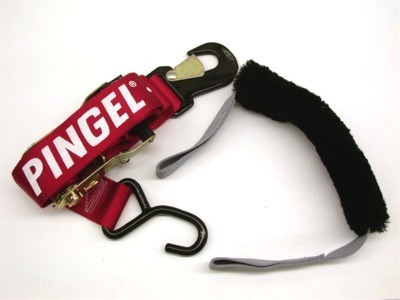 "LIFTING SLING"... Lifts while protecting ... 2" nylon lifting sling with flat ends. 3,100 lb. vertical rated or 6,200 lb. basket rated. Soft nylon webbing protects chrome and paint finishes.